Small bushy shrub with smallish, opposite, oval to elliptic mid-green leaves. Attractive bi-coloured flowers of peach pink and pale creamy yellow. 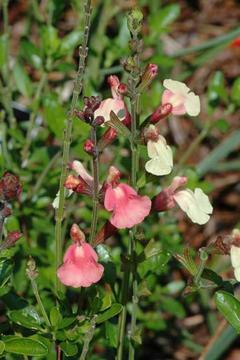 Derived from the naturally occuring hybrid of Salvia greggii x Salvia microphylla.